Veteran Safes have announced details of their soon to be released range of Eurograde fireproof safes. The Cobalt G1 combines Grade I burglar resistance with an impressive 60 minutes of fire resistance and a great value price. Tested, certified and approved by the ECB-S, the Cobalt G1 is designed to store and protect up to £10,000 in cash and up to £100,000 in valuables. An EN 1300 key lock or electronic lock provide security, as does the robust three way boltwork and the multiple relocking devices within the safe door. If the door is attacked with a drill in an attempt to manipulate the lock, these relockers seal the safe completely, protecting the contents from theft. Base anchoring allows the safe to be bolted to a concrete floor. The Cobalt G1 range has been tested by the ECB-S to the LFS fire resistance standard. It provides a certified 60 minutes of protection for papers and documents at temperatures up to 945° Celsius. Papers can withstand temperatures as high as approximately 177° Celsius before they char or combust. However, thanks to the design and materials of the Cobalt G1, the internal temperature will climb no higher than 170° Celsius. Available in 5 sizes, the Cobalt G1 is finished in a stylish anthracite powder coat, which looks good in either the home or office. 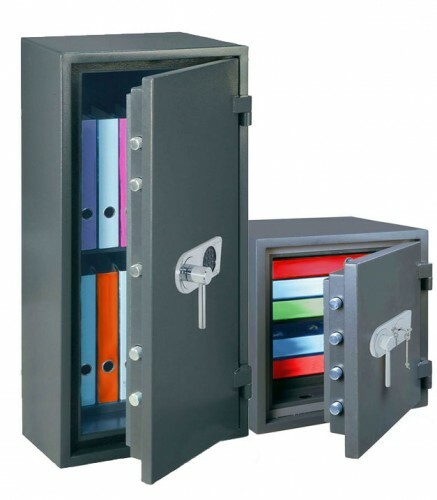 Models 4 and 5 have large capacities and would be particularly well suited to a commercial environment where confidential papers, cash or valuables are being stored. The Cobalt G1 is exclusively available from Veteran Safes.